An Ed Sheeran song was stuck in my head. It was playing on the radio while Dennis drove me to the airport. The midnight flight from San Francisco to Taipei was on time. In Taipei, I would have to wait nearly three hours for my connection to Manila. I hardly had enough rest because of our holiday in Vienna and, now, I was about to leap time zones once again. I was tired and anxious to get home. One day I’m flying in from a lovely trip to Vienna with my husband and just a day later I’m flying out to attend my sister’s funeral. Such is life. I don’t know if I have told you about Liz. There are six of us siblings. I am the youngest and the unico hijo. Liz is the second oldest. My sister is like a mother to me. I came out to her before I came out to anyone in my family. She showed me compassion like a mother would. Going to college wouldn’t have been possible if it weren’t for her. She helped pay for me to go to school, from tuition and books to stipends every month. She helped our parents and our family in so many ways. Her generosity was boundless. Her kindness cannot be measured. Sadly, we have lost her. She passed away this past December, a few weeks before Christmas. “Liz is gone,” my youngest sister delivered the sad news. Dennis and I were just returning from a trip to Vienna. I had known she was rushed to the hospital a couple of days before. I would later know that it started with a headache, which turned into heavy bleeding in her brain. My heart sank when I read the message. I was just in Vienna with my husband to celebrate our wedding and, now, happiness turned into grief in an instant. I spent the next four days with my family, with my mother who never thought she would lose a child in her lifetime. We remembered Liz through stories and old photographs, finding comfort in each other’s company, finding comfort in food. Liz was fifty five — oh, what a short life! Her sudden passing was terribly unexpected and it has left all of us brokenhearted. On the last day of the wake, my family wore something yellow — Liz’s favorite color. My Auntie Ludy, who stepped in for my mother as the cook during the wake, made a pot of chicken sopas. I spoke about my sister in between tears and spoke about how she will be missed. The following day we buried her with a sendoff of yellow balloons. It was a sad day. Heat oil in a pot over medium high heat. Saute onions and celery until fragrant and softened, about 5 minutes. Add chicken and brown on all sides. Add carrots and chicken broth. Bring to a boil then simmer over low heat until chicken is cooked. Add elbow macaroni and simmer until cooked but still firm. Stir in milk. Ads salt and freshly ground black pepper to taste. Serve hot. This photograph was taken when I visited home in 2010, the last time I saw Liz. 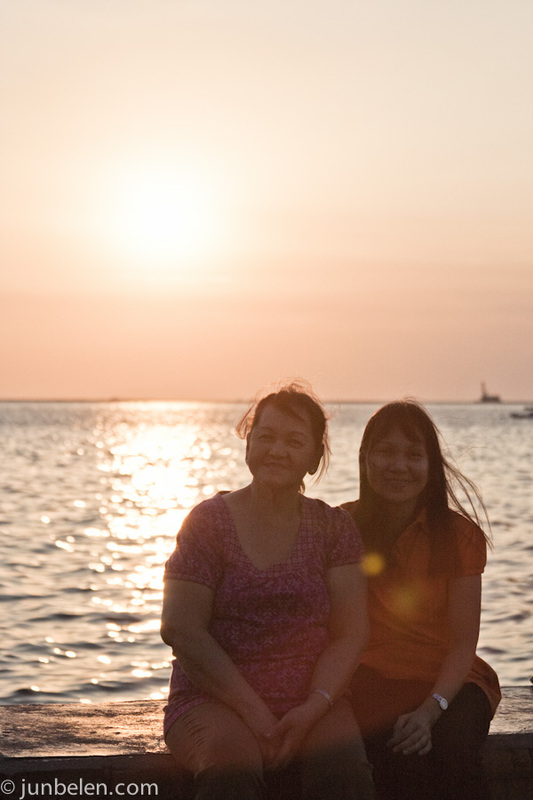 My mom, Liz, her husband, and I watched the sun set together in Manila Bay that day, then went for chicken barbecue for dinner. Just like the way we used to. Oh Jun, I am so sorry. I felt for you when I read the news in December, and I still feel for you. Find comfort in knowing her memory will live on forever. Oh my gosh, I’m so sorry to read these words. I have a sister, and because of that, my heart breaks for you. I’m so, so sorry. So sorry for your loss, Jun. Sending thoughts of love and comfort your way- hope they reach you. Jerrelle, thank you. So happy you found the blog. Mindy, thank you! Life is too short! Denise, thank you! Life is too short! Long time lurker here. I am so very sorry to read this! My sympathy to you and yours, and I will keep you in my thoughts. Thank you so much for the message. 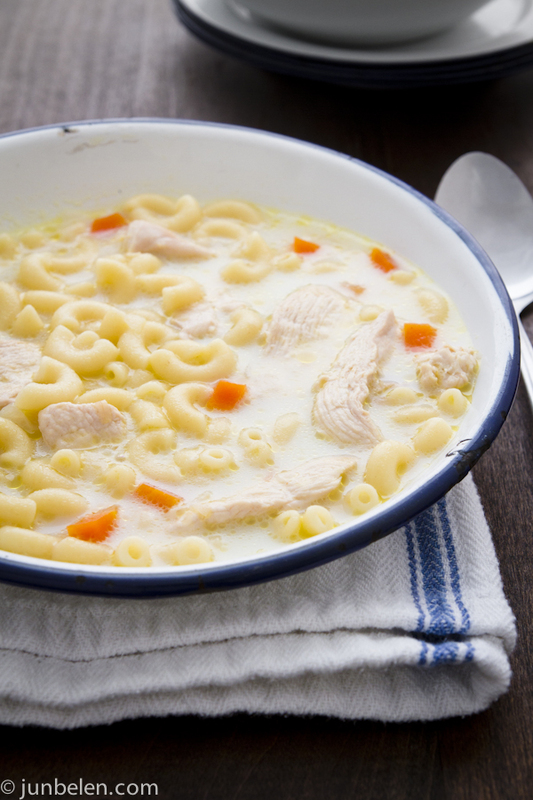 The pot of chicken sopas looks good, the perfect comfort food.